Following what was very much a balanced match overall, Jurgen Klopp now has the opportunity to end his time in Dortmund with silverware, going through to the Pokal final after two slips cost Bayern in the shootout. For a game decided by a penalty shootout, the previous 120 minutes were of intrigue as we saw Bayern’s 3-5-2 formation up against some interesting pressing from Dortmund, accompanied by tactical adjustments from both dugouts late on. Guardiola made somewhat of a surprise selection in terms of personnel, as Rafinha started at the left side of a back 3, with Boateng and Benatia. This highlights how well regarded the Brazilian full-back is, as he was selected over natural left-sided centre-back Dante (or maybe, it shows what Pep thinks of Dante instead…). Ahead of this defence was an impressive midfield trio of Alonso, Lahm and Thiago who was slightly higher in positioning whilst the former two supported the build-up more. Weiser and Bernat took to the flanks whilst the usual pair of Lewandowski and Muller started in attack. Klopp’s side set out in a narrow 4-3-3/4-1-2-1-2 shape which has been used in a number of games this season. Kagawa started as the central forward, making movements deep to link the midfield and attack, flanked by Aubameyang and Marco Reus. Amidst rumours of his transfer to Manchester United, Ilkay Gundogan made a strong performance alongside Bender and Kuba Blaszczykowski in the centre of midfield. Mitchell Langerak was fulfilling his role as cup goalkeeper behind a back four of Schmelzer, Hummels, Sokratis and Durm. In a game where Guardiola’s side dominated the ball possession, they didn’t use it to its fullest potential, which is in no small part down to the organisation of the visitors. The Bavarians were often allowed to make deep circulation across the back 3 (plus the dropping of Alonso and, less commonly, Lahm) however their access into the midfield was limited, and the options once they found themselves there even more-so. In addition, they were shown to the wings on a frequent basis which played a hand in their inability to break through into Dortmund’s third. 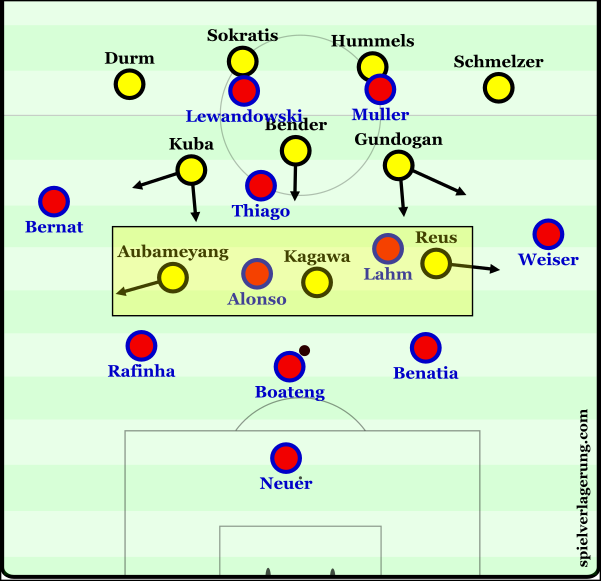 Through Klopp’s strategy of controlling the centre and half-spaces through a narrow 4-3-3, Dortmund were able to restrict Bayern’s possession game to a good extent. The compactness in the centre was a key feature with Bayern struggling to break through the narrow chain of 3 in midfield. Within the front 3, the central Kagawa was used primarily to block passes into the midfield whilst he often followed Alonso when the Spaniard dropped beside Boateng in the first line. The duo of Reus and Aubameyang occupied more polyvalent roles in comparison as they supported Kagawa in the central press and blocking of passes into Lahm and Thiago, but were also key in the wide pressing as they moved outwards to isolate the ball on the wing. Deeper, the narrow chain of Gundogan, Kuba and Bender was effective in nullifying the creative talents of Bayern as their compact pressing minimized the options from the centre of the pitch. The wider two were also quite important in the central pressure, moving up in the half-spaces to make a few high regains especially during the first 45. 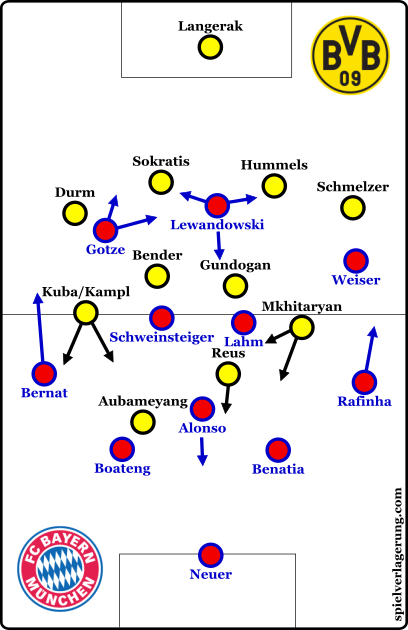 The battle of Bayern’s build-up and Dortmund’s pressing was an interesting tactical battle fuelled by Guardiola’s use of Rafinha in a wide back 3. Through the wide positioning of Rafinha and Benatia, Bayern were able to open up the centre of the pitch for Alonso and Lahm to try and advance the ball. This wide chain stretched the otherwise narrow press of the Dortmund front 3 which created gaps in the half-spaces when neither Gundogan nor Kuba followed higher. 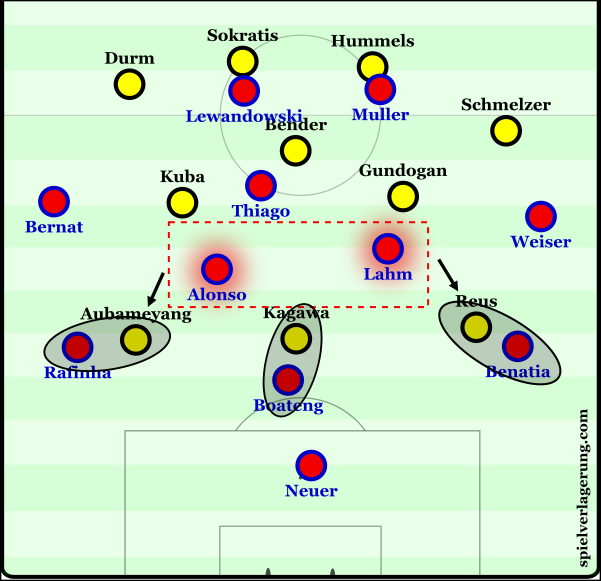 Had Bayern utilised such situations better then Dortmund could potentially have been forced to alter their shape mid-game as the 10 space was opened often, especially during the earlier stages of the game. Gundogan and Kuba at times didn’t have the opportunity to push ahead and meet Lahm and Alonso as they received the ball, for had they mistimed the press then they would’ve left the midfield weak and lacking stability. Alternatively, in reaction to the Bayern midfield breaking the first line of pressure they looked to maintain the compact midfield and stop any penetration into higher lines. This quiet commonly forced a lateral pass, allowing the front 3 to make recovery movements to regain an organisation and even potentially suffocating the ball possession against the touchline in their wide press with the midfield shifting across. For the first 60 minutes of the game, the visitors’ main issue was simply a lack of threat in attack. For the most part, they were left to just counter-attacks in terms of going forward which didn’t create many threatening opportunities. As the second half progressed the momentum changed as BVB’s attack improved greatly and they produced a number of chances which tested Neuer. Central to this was the formation change of Klopp, who with the introduction of Mkhitaryan for Kagawa shifted into a 4-4-2 formation leaving Reus playing just behind Aubameyang as a central pair. Usually this season, only bad things have happened when Klopp attempted a 4-4-2 shape (albeit, this time Ramos stayed in the dugout) however this system worked well with Mkhitaryan occupying a central role as he came in from the left midfield position. Guardiola made tactical changes of his own as the game progressed, surprisingly with the first change he brought off Thiago for Robben (who would later suffer another injury), which subsequently weakened the Bavarian control of the game massively. This change could possibly be a factor in the improvements of Dortmund as much as the work of Klopp, given the unprecedented influence of the ex-Barcelona midfielder on the possession game. The main change of shape for Bayern came close to the end of 90 minutes, as a switch to a 4-3-3 formation was made with Gotze wide left whilst Rafinha returned to his more familiar right-back position in a back 4. Through this, Pep may have simply been looking to provide some stability as Dortmund were threatening as the 90 minutes drew to a close, or simply may have been reacting to Robben’s injury in the 84th minute. Formations towards the end of the game. Dortmund did well to maintain the balance throughout the game despite Bayern’s dominance in terms of ball possession. Neither team had great chances, especially the visitors whose attacking game was lacking up until around the 60th minute. Through the luck of a penalty shootout, Klopp has the chance to end his Dortmund tenure with a Pokal final win against what will be a difficult Wolfsburg opposition following their slightly easier passage against Bielefeld tonight. I liked the analysis, but I don’t agree on the conclusion. Dortmund ran after the Ball for 70 minutes and after Kampl got sent off. The difference to other games is that Bayern could more or less play the ball wherever they wanted it to be and Dortmund barely prevented good chances. That stuff doesn’t happen very often and was a remarable success for Guardiola. In my opinion, Bayern didn’t have the freedom to play the ball wherever, as they rarely penetrated the centre and frankly, if they did have this luxury then the game wouldn’t have reached extra-time let alone penalties. Also, BVB used less of a press than usual and at times sat more reserved in a mid-block – I wouldn’t say they ran after the ball which also does a disservice to their well-organised pressing game.